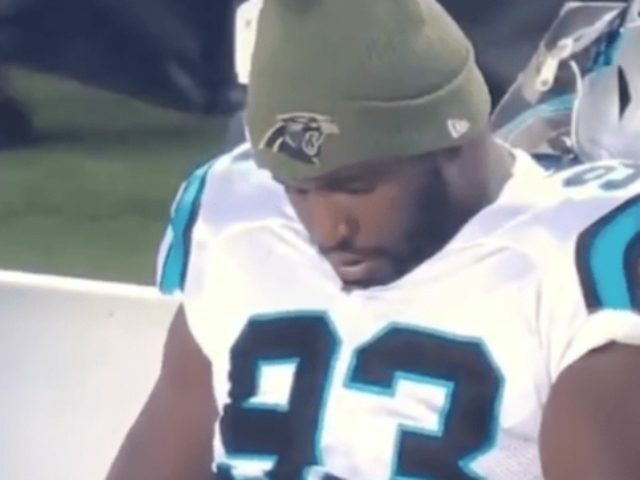 Carolina Panthers defensive tackle Kyle Love is taking a ribbing today on social media, after video seemed to show him nodding off during the Panther’s game against the Steelers on Thursday. A short video clip of the player sitting on the sidelines spurred fans to wonder if Love fell asleep sitting on the bench during the Panthers’ 52-21 loss to Pittsburgh. Barstool Sports joked that Love and his team were “tapped out” on Thursday as the Steelers ran all over them. Many others wondered what was going on, there, too. “If you stayed awake for the end of Panthers-Steelers…you one-upped one specific member of the Carolina Panthers,” 12Up’s Adam Weinrib joked. Indeed, many fans felt that the video of Love dozing off on the sidelines was a perfect metaphor for the way the Panthers played that night. For his part, Love has not commented on the viral video.